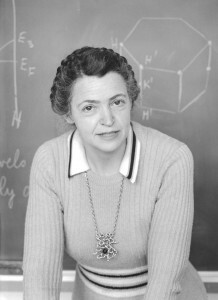 Mildred Dresselhaus. Image from¬†NSF (Georgia Litwack). Mildred Dresselhaus was born in Brooklyn on November 11, 1930. The daughter of Eastern European immigrants, the only career option that was seriously presented to her through the New York school system was that of school teacher. She did ultimately end up in education, as a professor at MIT (Massachusetts Institute of Technology), even becoming the first woman to be an Institute Professor of the University (similar to a distinguished or regents professor at other universities). Not quite the same as a school teacher, though! Referred to as the “queen of carbon science,” Mildred’s research has focused on carbon nanotubes, bismuth nanowires, and low dimensional thermoelectricty. Her work is relevant to the energy sector, as carbon-based materials can increase the the storage capacity of batteries. In fact, her research into carbon-based materials led to President Obama presenting her with the Presidential Medal of Freedom in 2014, saying, “Her influence is all around us, in the cars we drive, the energy we generate, the electronic devices that power our lives.” This year, Mildred is being awarded the Institute of Electrical and Electronics Engineers highest award, the IEEE Medal of Honor, for her ‚Äúleadership and contributions across many fields of science and engineering.‚Äù She is the first woman to receive the award in the organization’s 98 year history. Not only has Mildred’s research advanced the field of carbon electronics immeasurably, but she has also successfully helped over 60 Ph.D students graduate, and mentored many others, including 4 children of her own and 5 grandchildren. She’s been honored with a multitude of awards for her research, as well as for encouraging women in science, such as the 2007 L’Or√©al-UNESCO Awards for Women in Science and the 2009 ACS Award for Encouraging Women into Careers in the Chemical Sciences. As early as 1973 she was striving to encourage women in science, receiving the Carnegie Foundation grant to encourage women’s study of traditionally male fields. That same year she was appointed to The Abby Rockefeller Mauze chair at MIT which was endowed to support the scholarship of women in science and engineering. Her tireless work, in both her research and support of women in STEM, is inspiring!